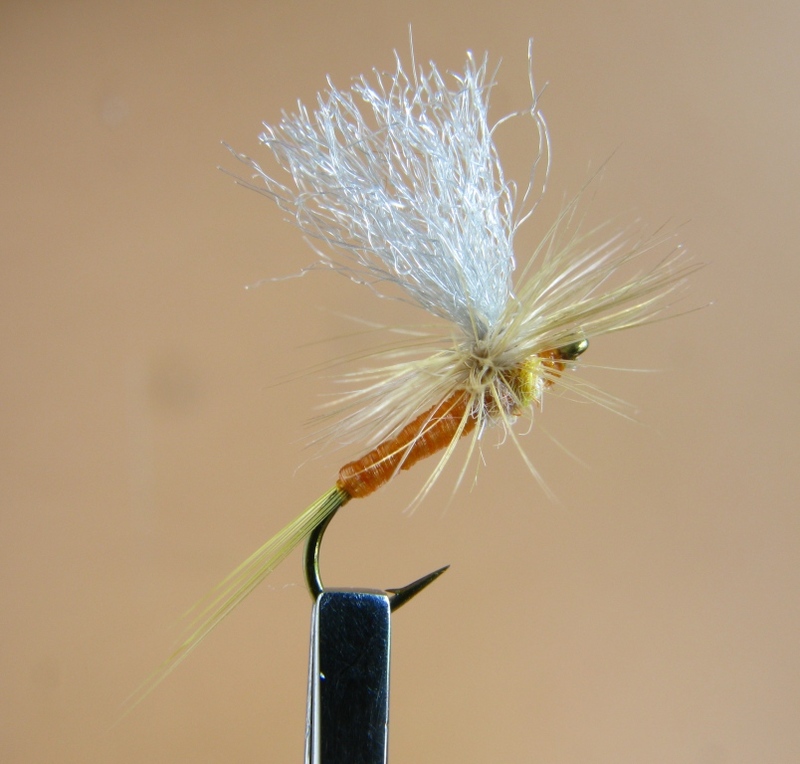 Not too long ago I posted photos and recipes for some dry fly patterns: a Sulphur Thorax Dun and Sulphur Parachute Dun. This post contains photos of the same Sulphur Parachute pattern – for review and a few different photos, but I also present another variation, a Sulphur Parachute Thorax Dun. What is the difference? The Thorax Parachute Dun pattern has the wing positioned slightly more toward the center of the hook shank, and to make it different and give my customer more options to imitate the slightly different coloration that can occur with the Sulphur or Ephemerella invaria duns, I used dubbing only on the Thorax Parachute Dun pattern, and ribbed it with the tying thread, whereas the Standard Parachute Dun has an abdomen of Sexi-Floss. 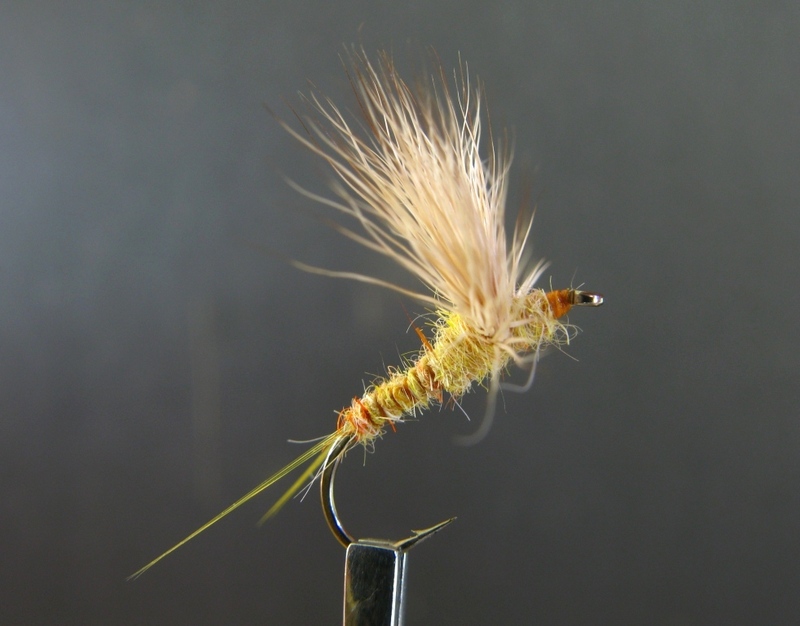 #16 Sulphur Parachute Dun, tied and photographed by Don Bastian. 1) Start thread on hook, lay thread base for wing placement on location 1/3 distance behind hook eye. 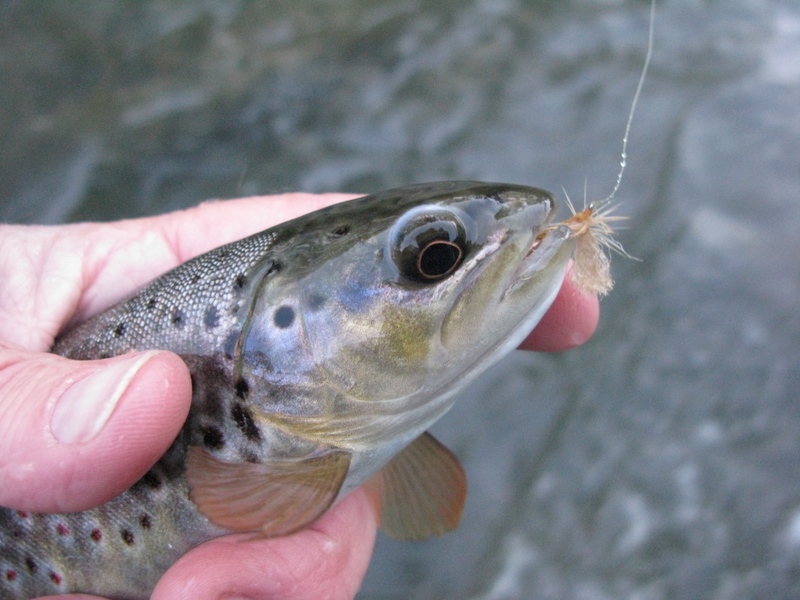 2) Place E. P. Fibers for wing (these need to be sized / bunched to the hook / fly size ahead of time), on hook shank and using a pinch wrap, make three or four wraps in place to lash them to the hook. Then make one wrap in front of and one wrap behind the fibers. 3) Grasp the wing fibers, pull them up (or down – see my Parachute Adams tying post), and post around the base of the fibers until the wing is gathered together. 4) Attach the hackle to the base of the wing post. Be sure to clip the barbs from the stem at the tie-in point, rather than stripping them off. 5) Wind to hook point, attach Microfibetts. 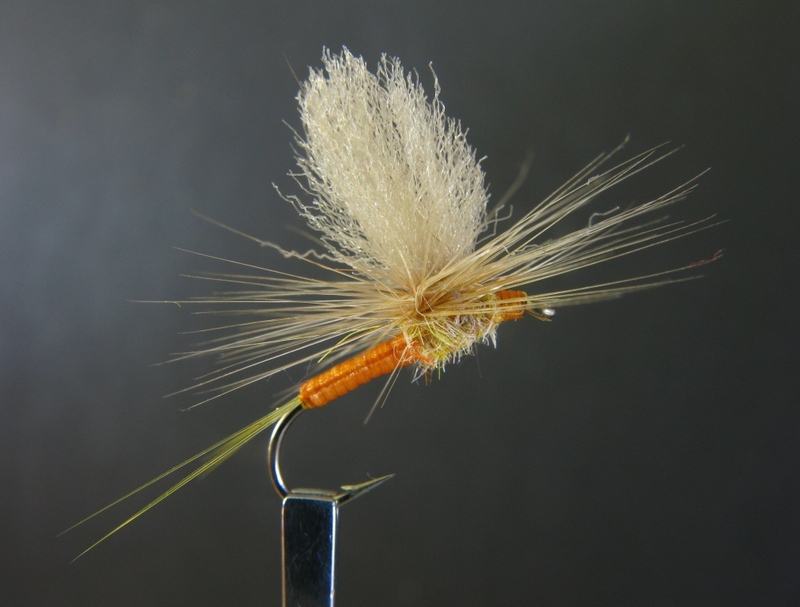 See the Hendrickson / Red Quill Parachute pattern post for the method to divide these fibers. Four figure-eight wraps are used to divide the fibers after you flare them out with your left hand index finger and thumb. 6) Advance thread to thorax, attach Sexi-Floss. Stretch the Sexi-Floss and wind thread to base of tail. Return thread to thorax. Wrap the abdomen. Tie off with three – four tight wraps, trim Sexi-Floss. 7) Apply dubbing to thorax, move tying thread to back of head, not hook eye. Ideally you want to tie the hackle off slightly behind the hook eye. 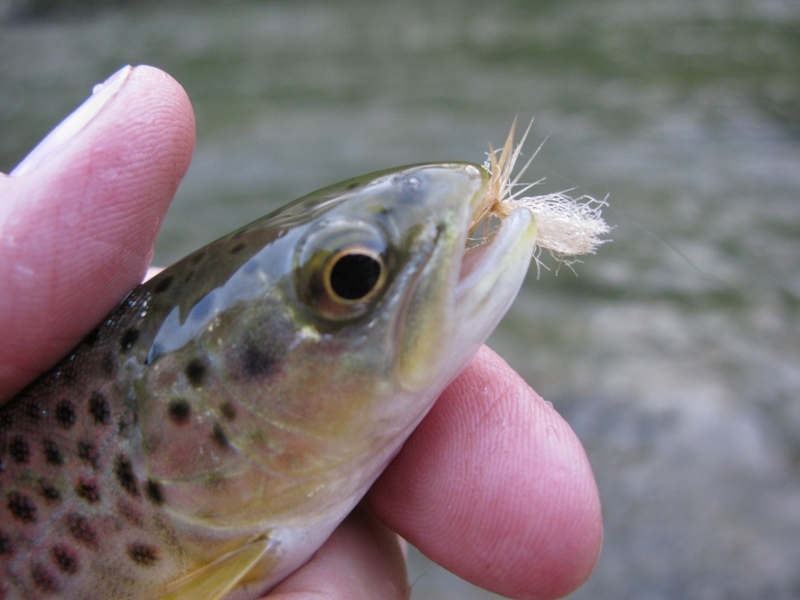 8) Wind hackle counter-clockwise to avoid trapping fibers when you finish it off. Again, see the Parachute Adams and Hendrickson Parachute posts. 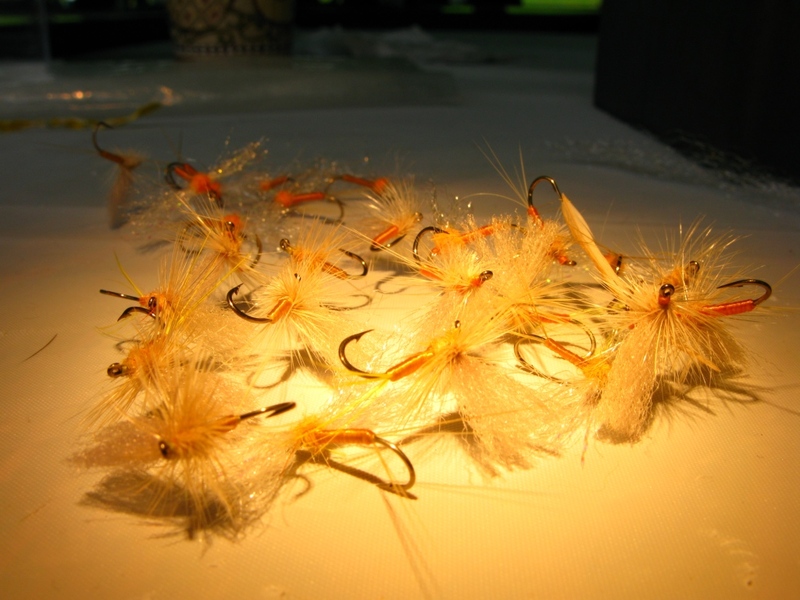 #16 Sulphur Parachute Duns, one dozen, tied and photographed by Don Bastian. You can see that I did a half-and-half mix of the wings, using both light dun and tan E. P. Fibers. 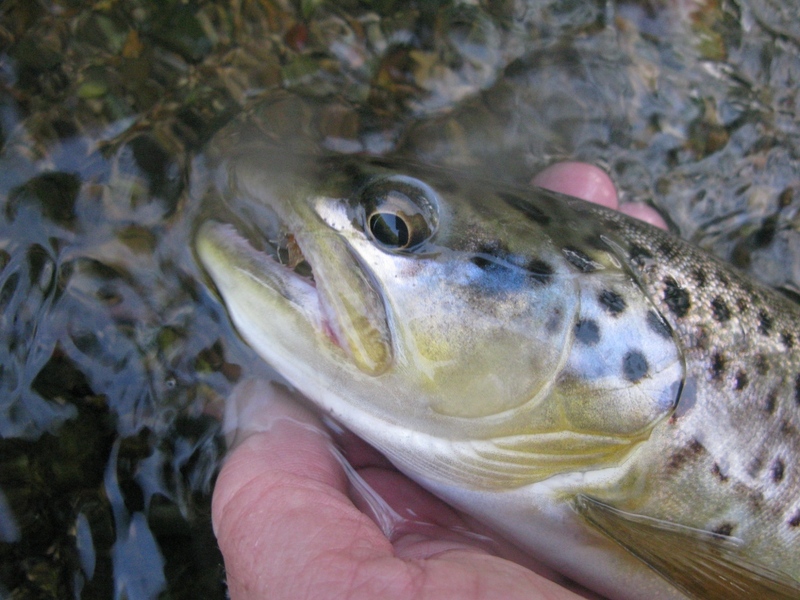 This mixes it up just a bit to help fool more trout. 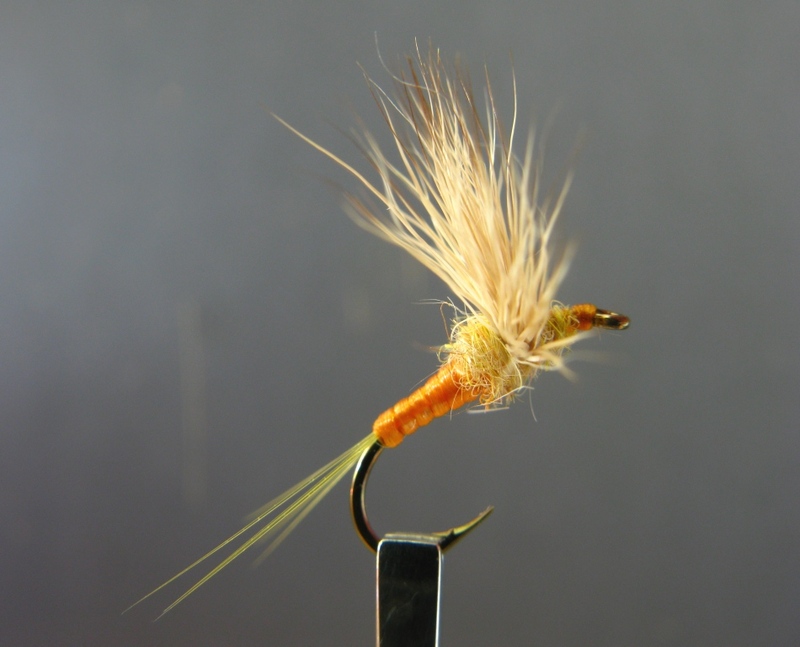 #16 Sulphur Thorax Parachute Dun, tied and photographed by Don Bastian. Notice the wing placement is a little closer to the hook point, in fact just about half-way between hook eye and point. Notice the abdominal ribbing, this is reverse-dubbed. See details below. 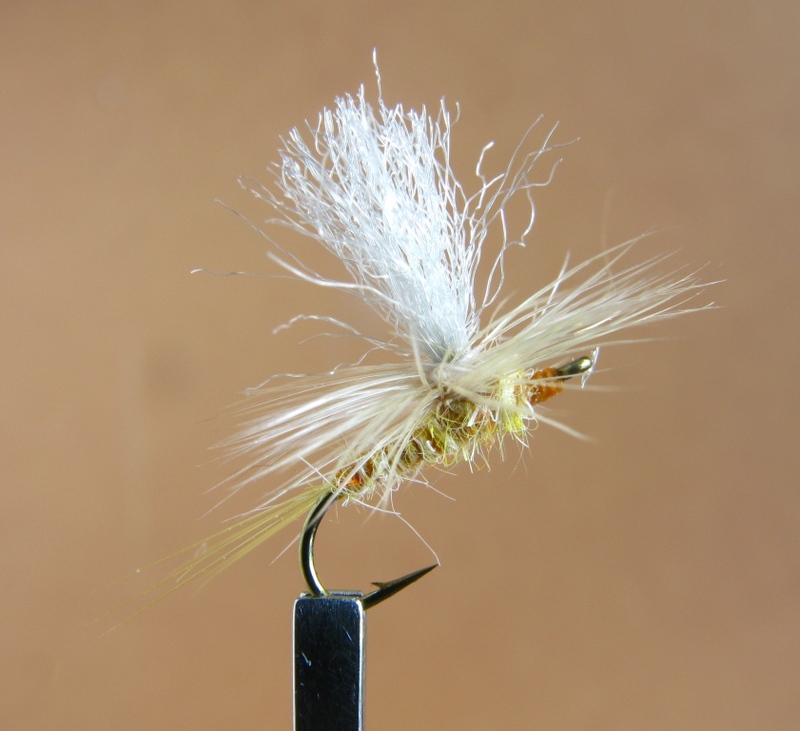 1) Set the wing and hackle as in the instructions above. 3) Advance thread to base of wing, apply dubbing, sparingly, the goal being to wind dubbed thread to the base of the tail, and run out of dubbing exactly at the end of the body. Then merely wind the tying thread right from the bobbin, up to the base of the wing, spacing it evenly to create ribs. 5) Wind the hackle counter-clockwise, lock in place with three or four thread wraps, trim off, build head and whip finish. It is sometimes necessary to pull or clip guard hairs from the dubbing to tidy up the body. 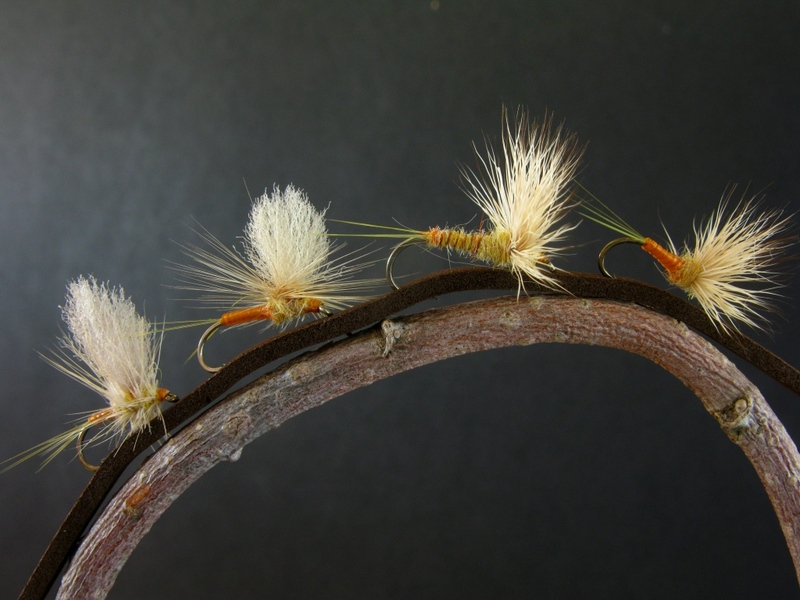 You could use Superfine Dubbing for the abdomen and rabbit for the thorax; I chose to use rabbit fur on these flies. 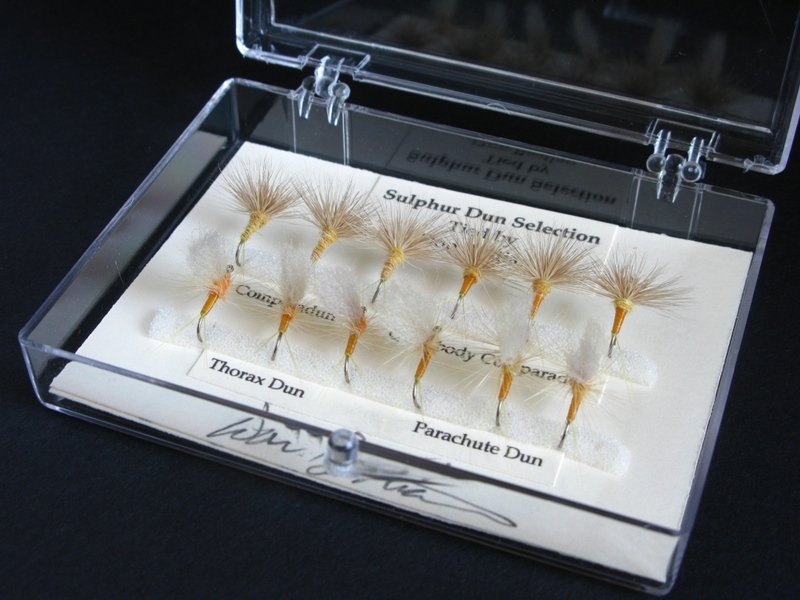 One dozen #16 Sulphur Thorax Parachute Duns, tied and photographed by Don Bastian. Notice the split tails. This is highly imitative and also helps to stabilize the fly on the water. Both these pattern styles offer the option of changing hook sizes, wing, tail, hackle, and dubbing colors. 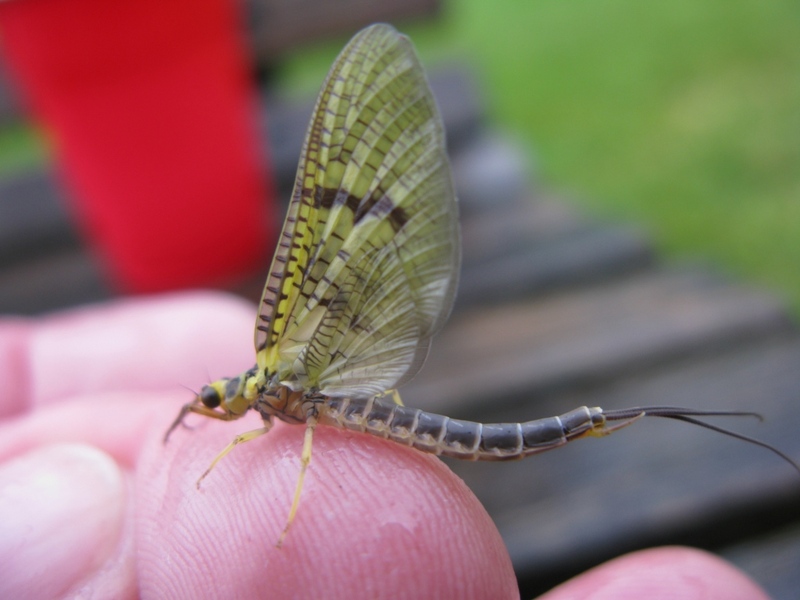 Accordingly, a multitude of mayflies can be imitated with this pattern style: March Browns, Blue-wing Olives, Slate Drakes, Hendricksons, Green Drakes, Pale Morning Duns, etc. 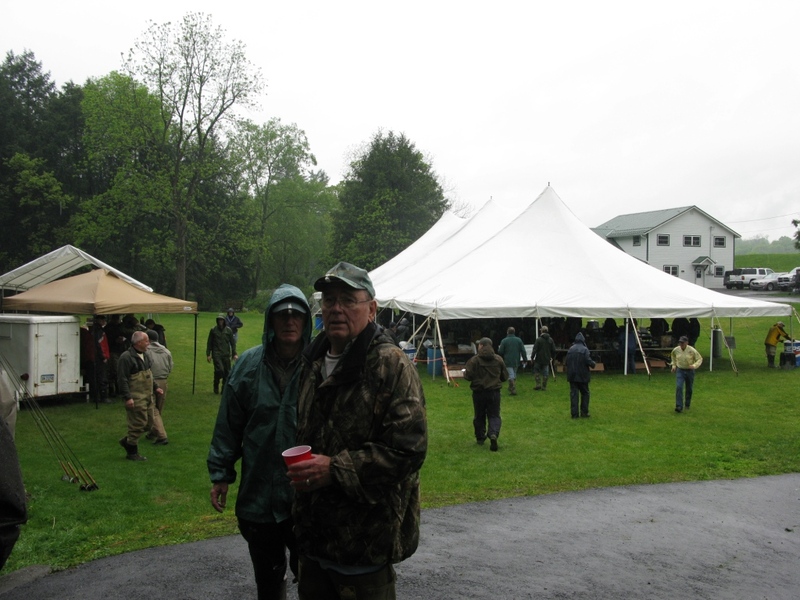 On Monday May 13th, the 17th Annual On The Fly Event will be held on Spruce Creek, Pennsylvania, on the property of the Wayne Harpster family. I have been invited to participate as a guest fly tier; this will be my fifth or sixth appearance at this event. It is a great time! 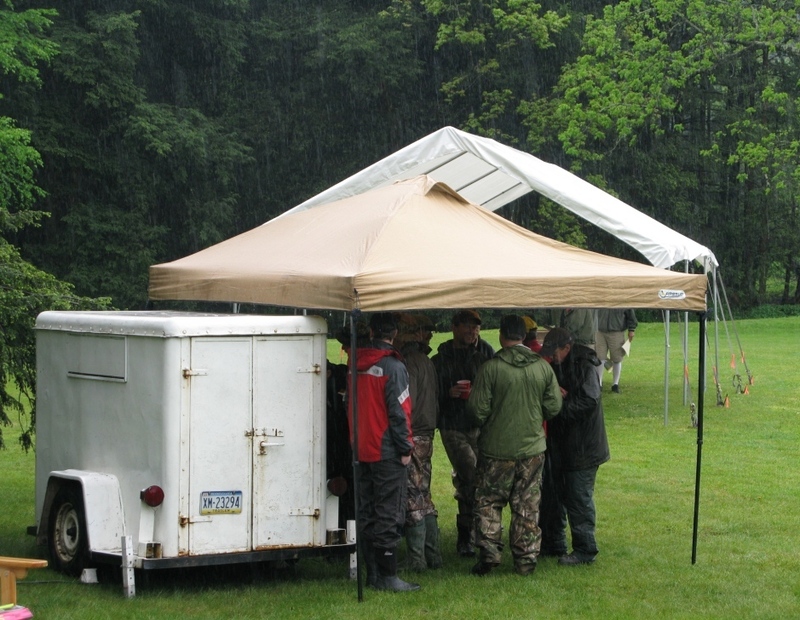 On The Fly is a fund-raising event for Centre County Youth Services Bureau. 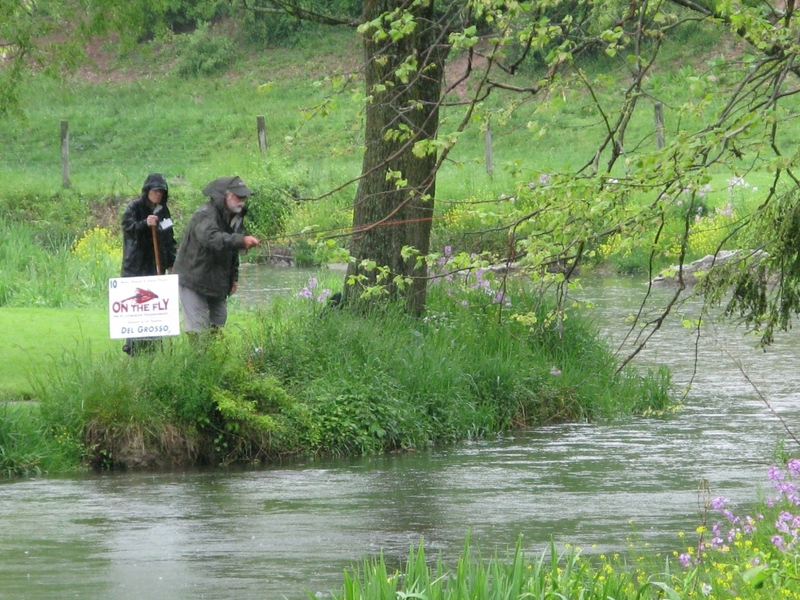 Four-person teams compete by fishing on assigned beats. 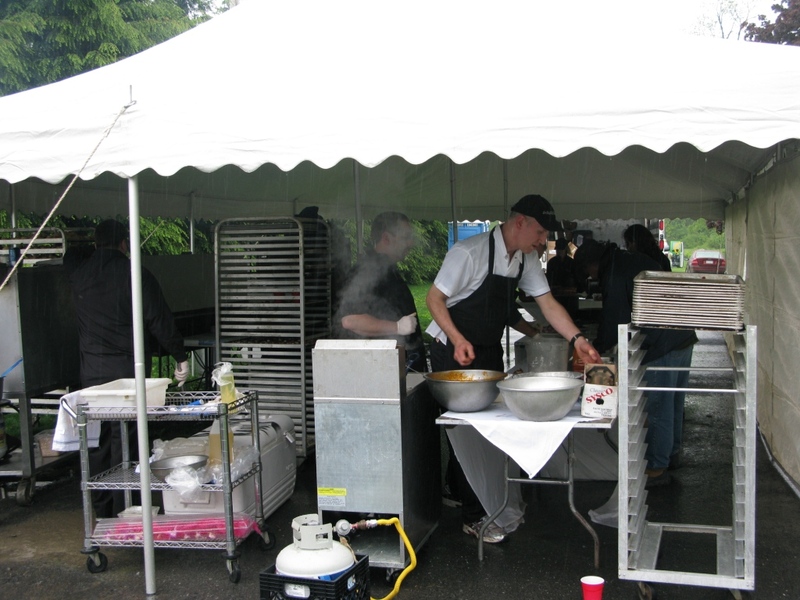 Various sponsors contribute to promote the event. 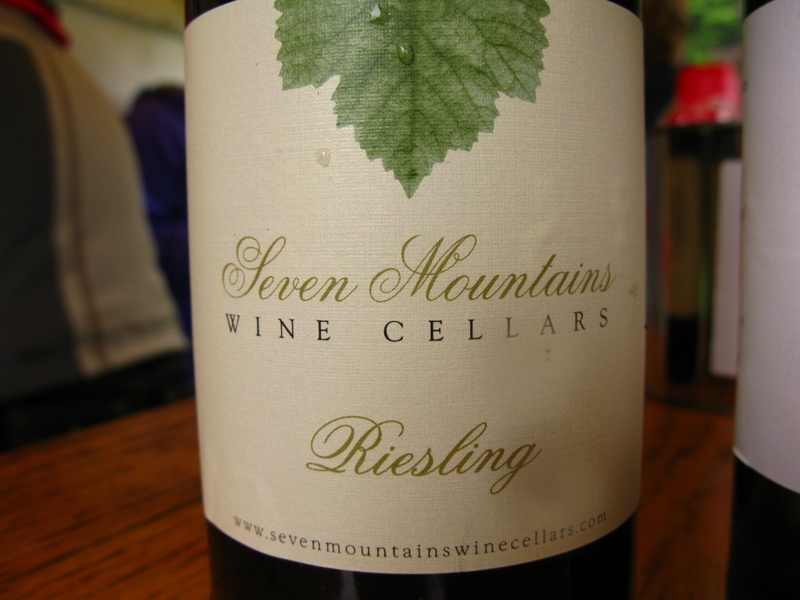 Food is catered, a local winery and brewery make beverage contributions to help support the event. My part is mostly spent tying flies as entertainment for the team members and volunteers during their off times. I donate flies in return for my participation. 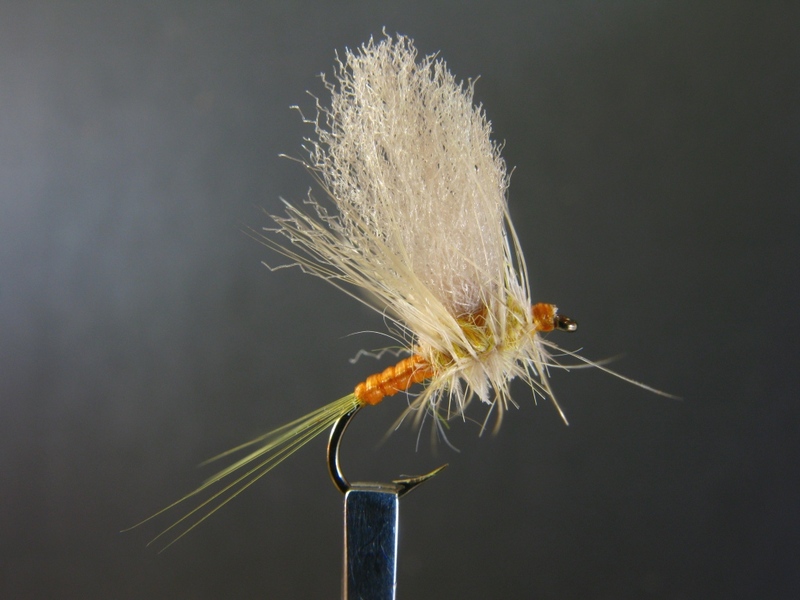 This year I am donating three dozen fishing flies and a collection of twenty Carrie Stevens streamers patterns, tied by me, presented in a Riker Mount. There is a live auction in the evening after dinner. 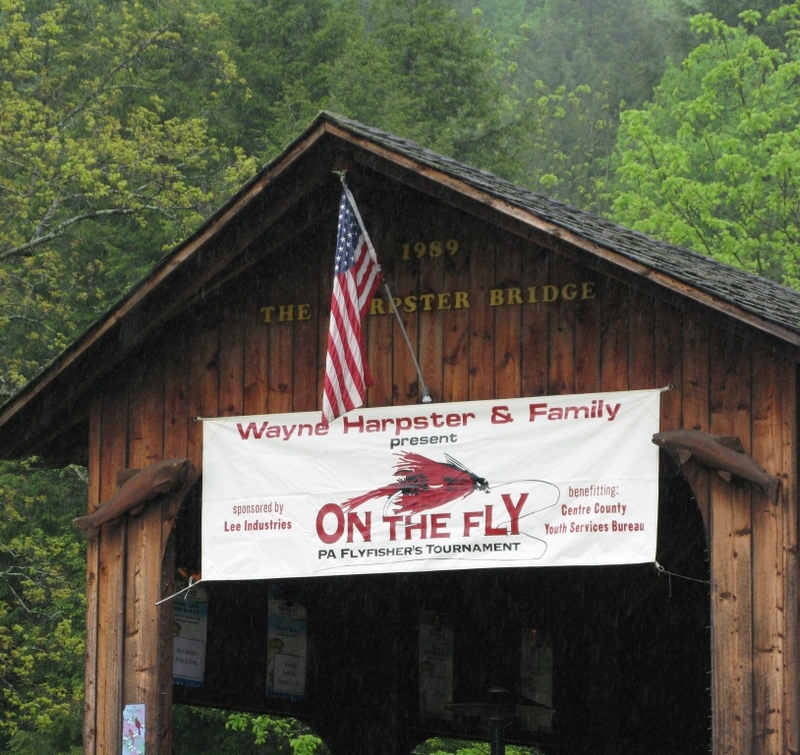 On The Fly sign at the Harpster covered bridge on Spruce Creek. 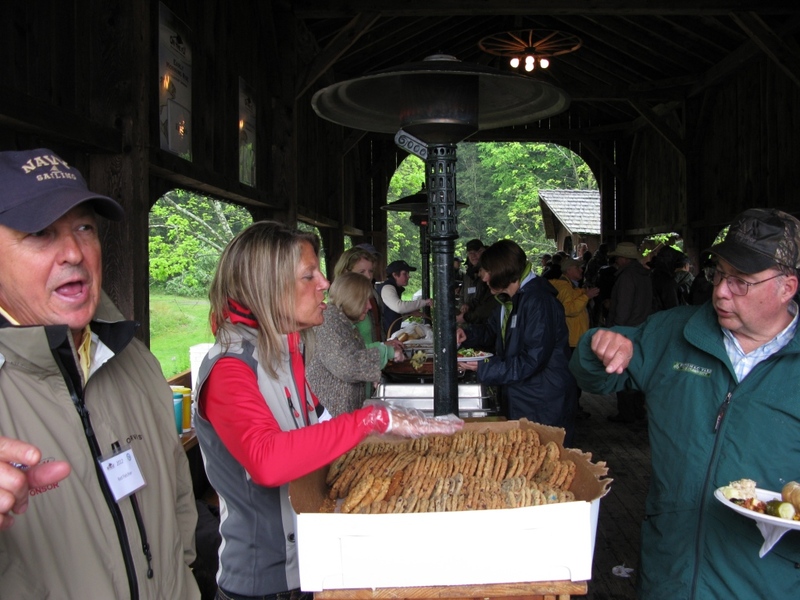 Breakfast and lunch are served buffet style on the covered bridge. Look at those cookies! Yum! 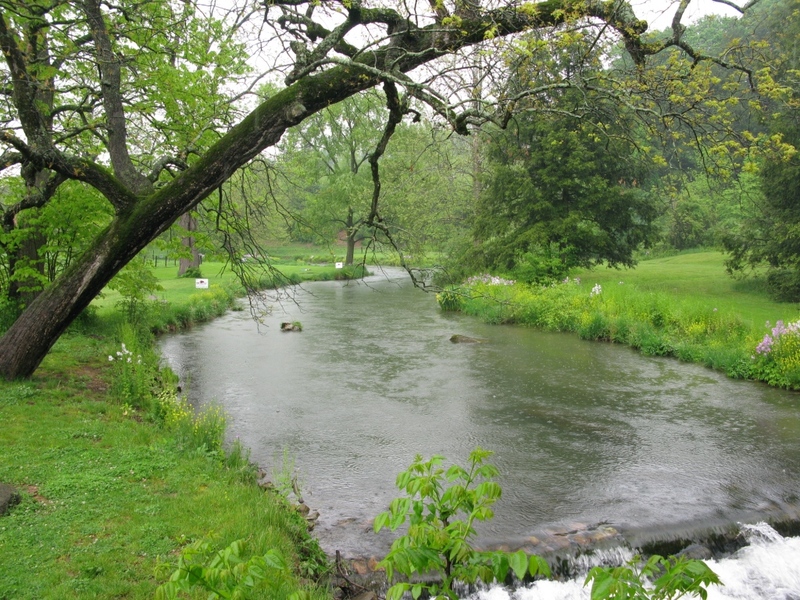 View of Spruce Creek looking upstream of the covered bridge. 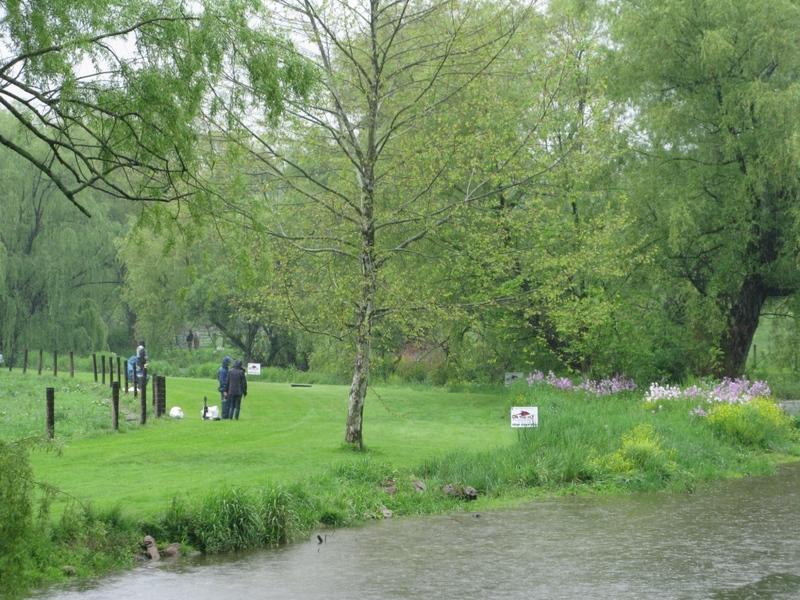 The signs designate the boundaries of the fishing contest “beats.” You can see the rings on the water – it was raining. 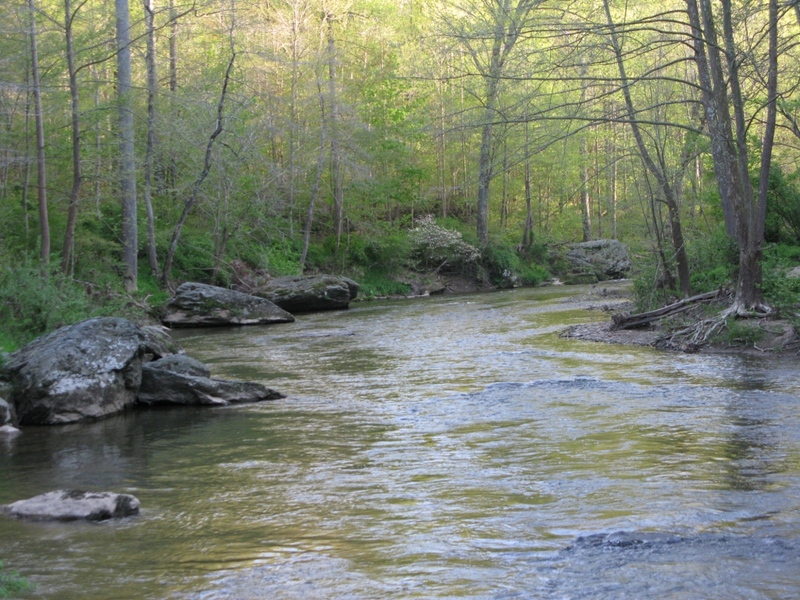 View of Spruce Creek downstream from the covered bridge. 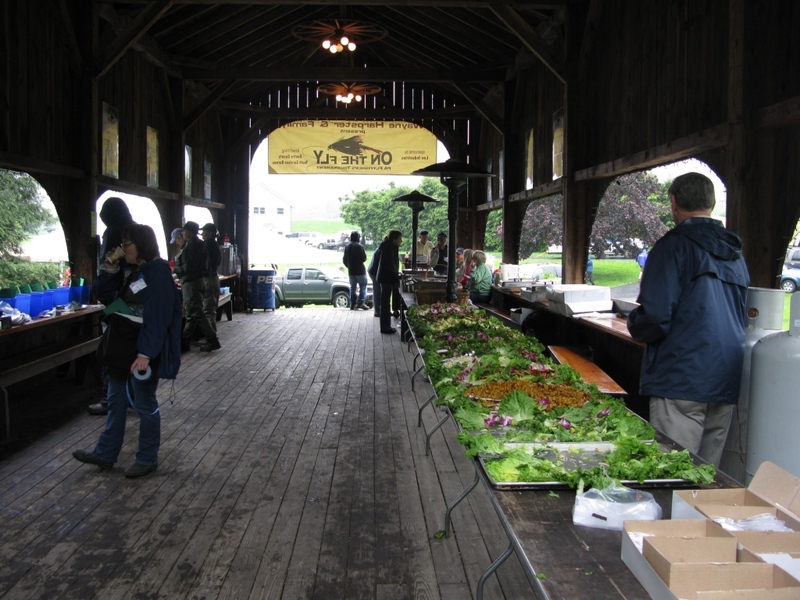 From the covered bridge entrance, a view of the main dining tent, the Harpster cabin (partially obscured), and the Otto’s Brew Pub beer trailer at left. Yes, it was raining off and on last year, mostly on. 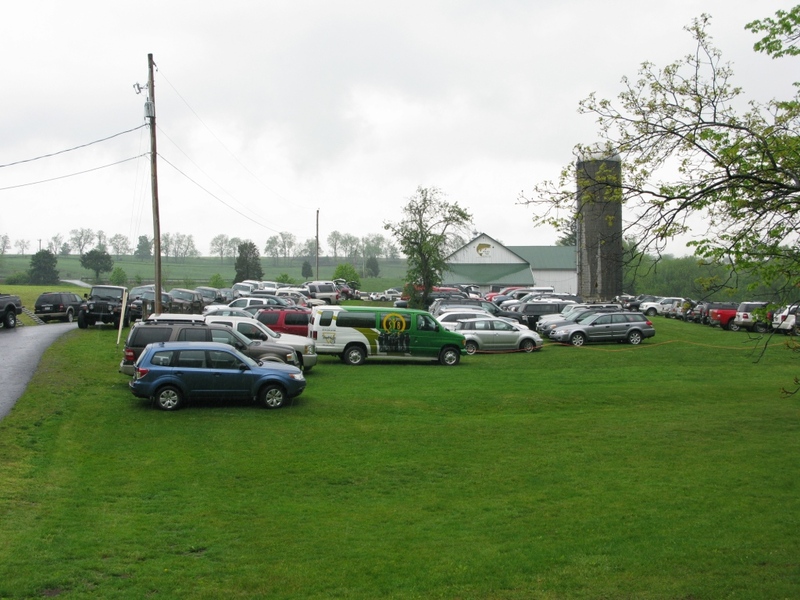 Parking area. There are usually twenty or more four-person teams, plus sponsors. 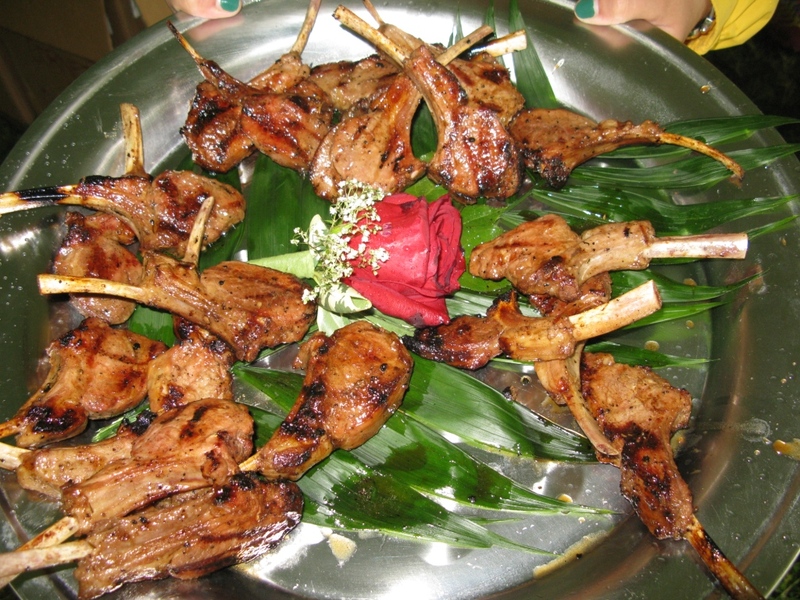 The evening meal is probably served to close to two hundred persons. 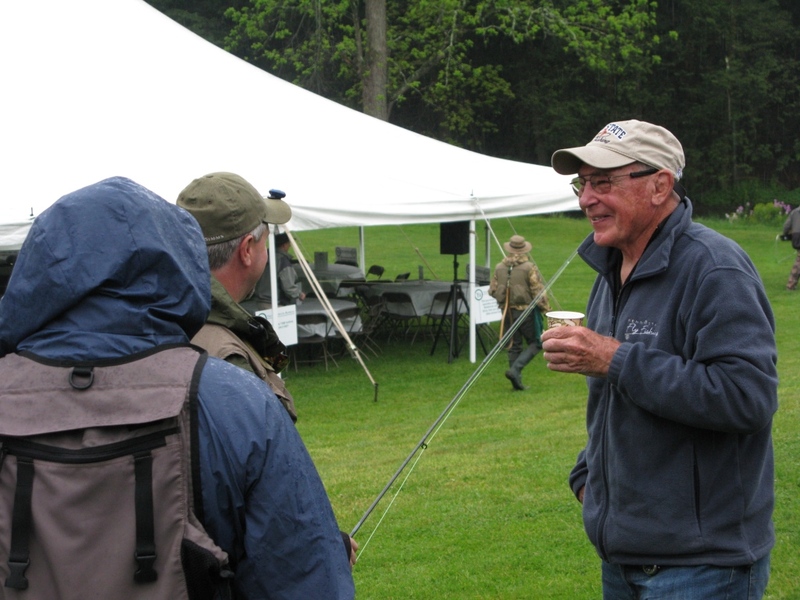 Pennsylvania fly fishing celebrity and author Joe Humphreys, right, shares a laugh with contestants. Contestants prepare for the first afternoon beat. 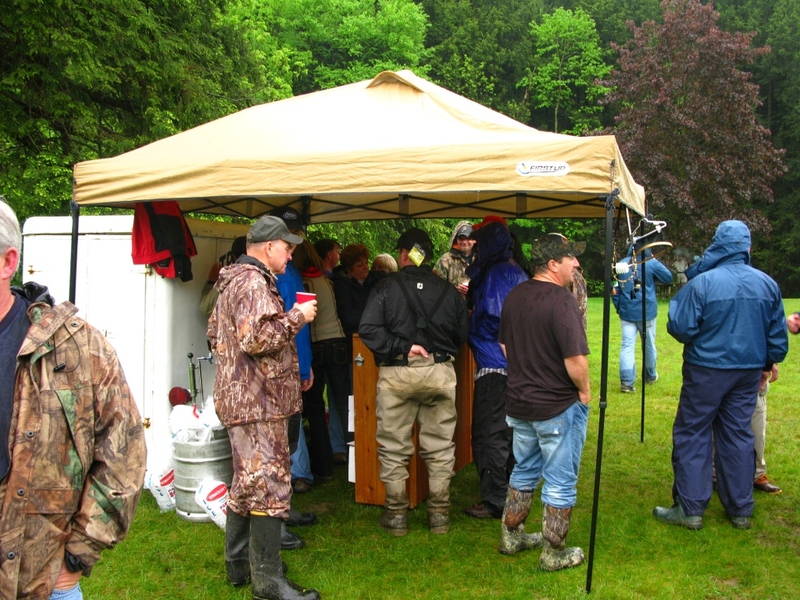 The beer trailer was a popular spot. 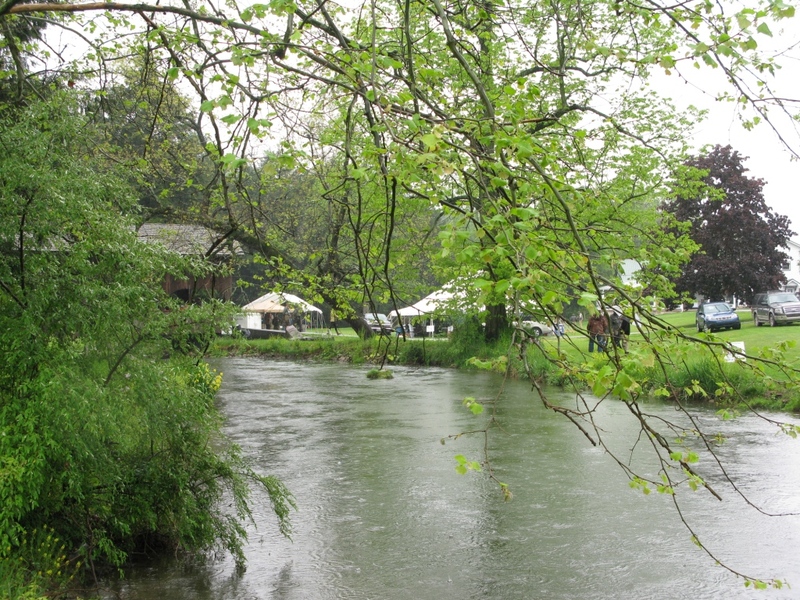 Above the covered bridge, view downstream prior to the first afternoon beat. 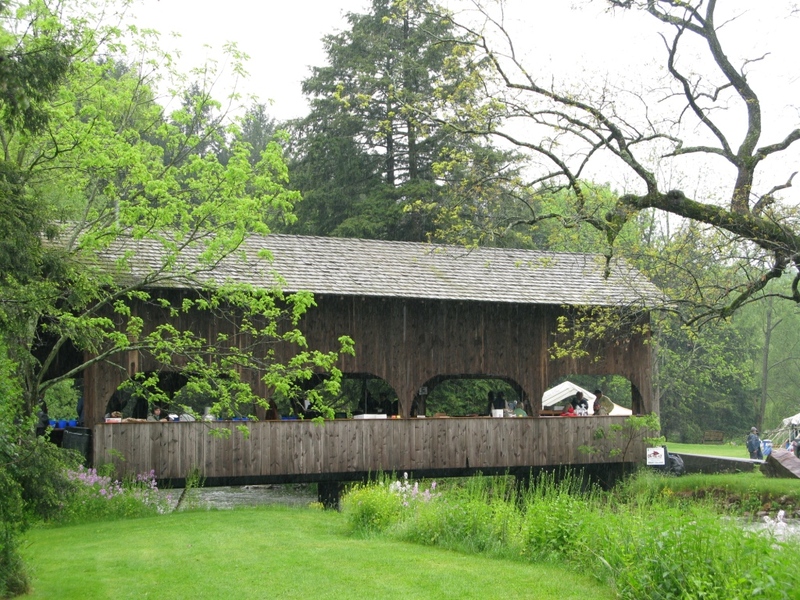 The covered bridge. This is a really peaceful, tranquil location. View of the lunch buffet after most of the crowd had passed through. Note the electric fan light combinations. This is a deluxe model of a covered bridge. My good friend, Paul Rebarchak, of Boalsburg, Pennsylvania, was a contestant last year. 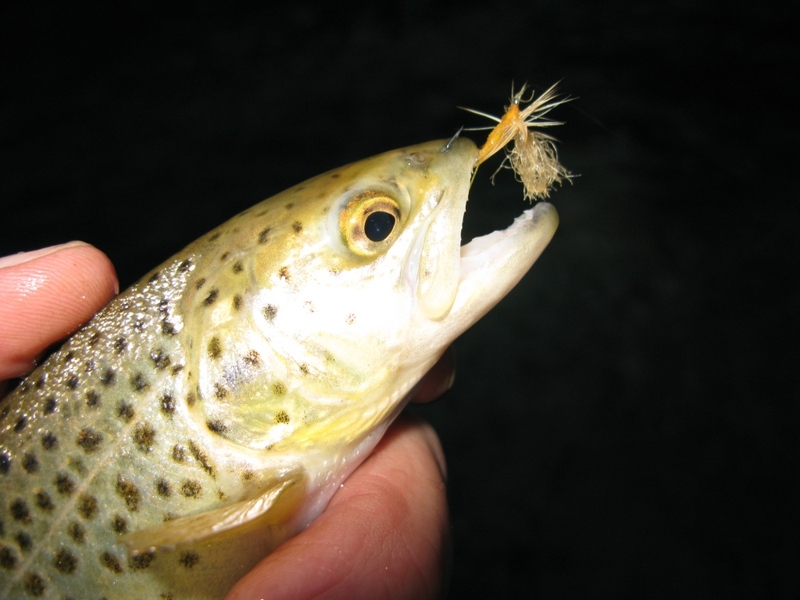 Here he is concentrating on his drift while nymph fishing. 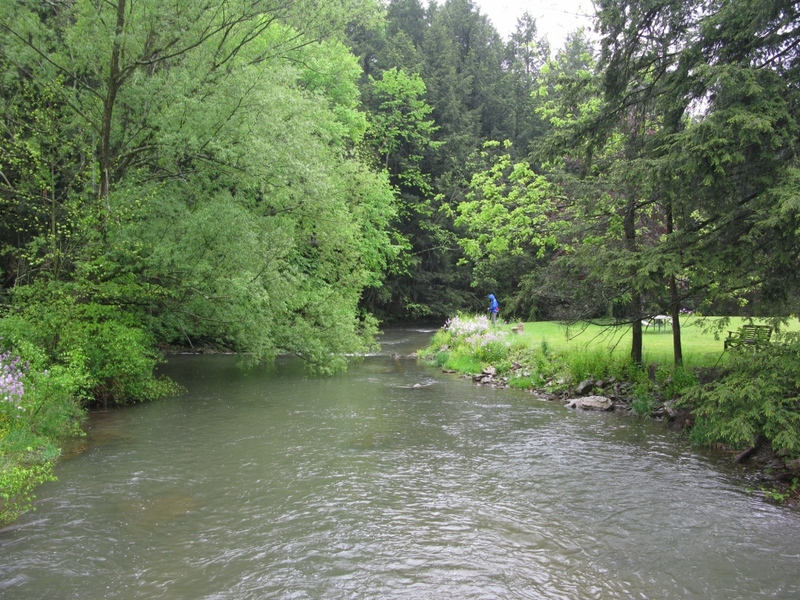 The person to his rear is the controller – they measure and record the trout for point scoring, and also ensure rules are followed. 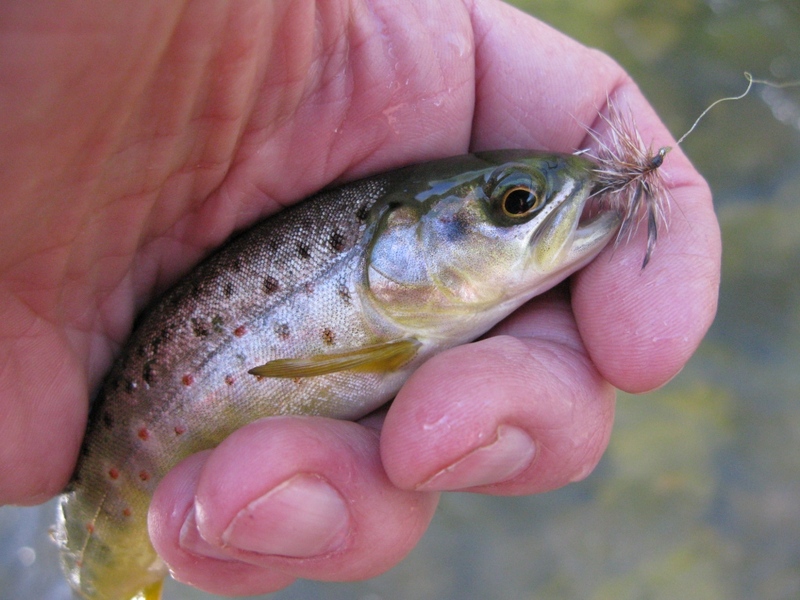 If you lose your fly, you are finished fishing that beat. 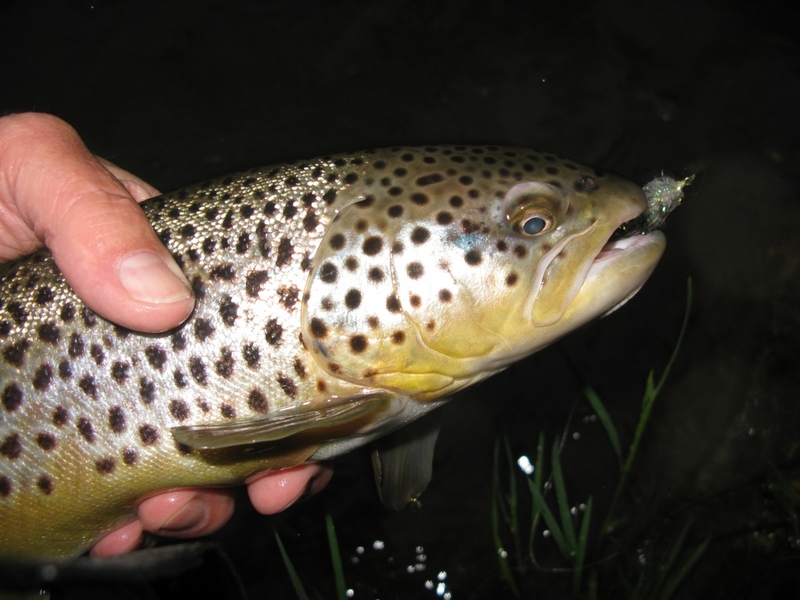 Large fish can be encountered, five or more pounds, so most contestants use heavy (2x or 3x) tippets. 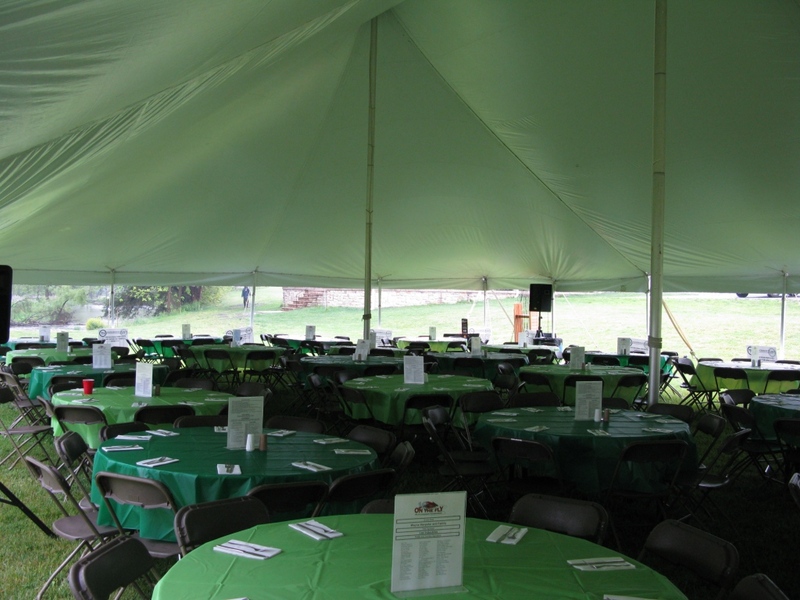 The main tent – table settings ready for dinner. 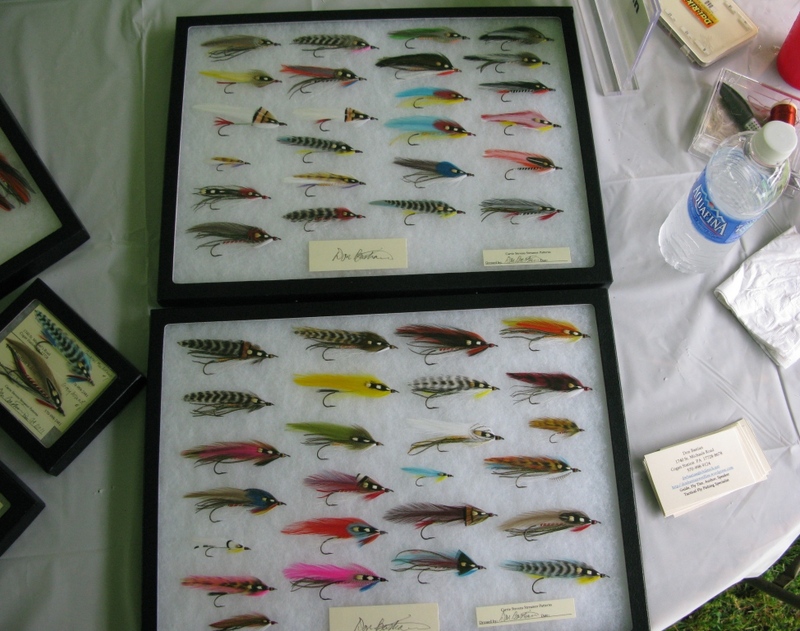 Some of my Carrie Stevens streamer patterns displayed in Riker Mounts. 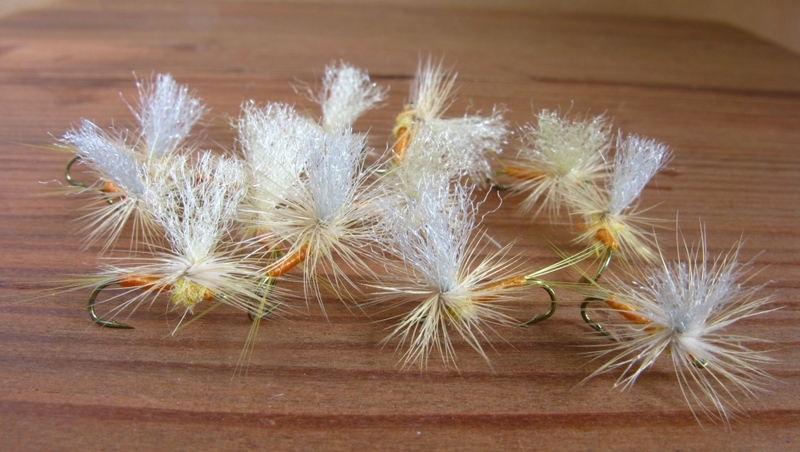 #14 Sulphur Parachute Duns and spinners that I tied during the day last year. The abdomens are made from sulphur orange Flexi-Floss. (Which I found out from the Orvis Rep, Doug Baer, is no longer an Orvis product). 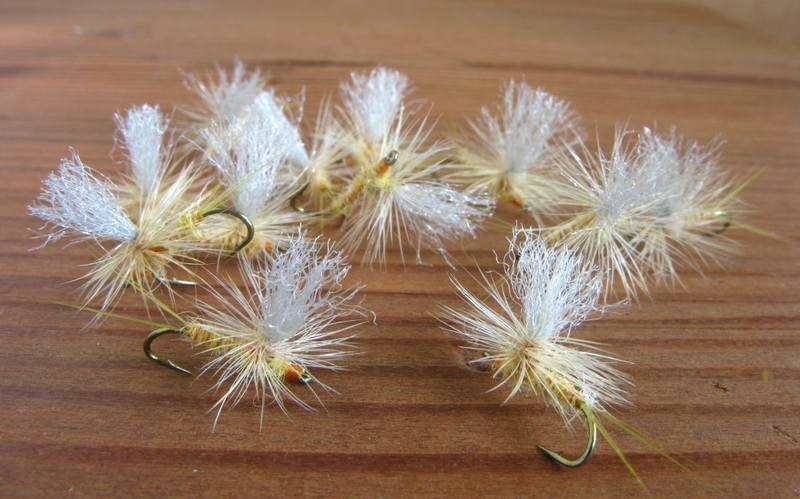 The Super Floss, Dyna-Floss, Flexi-Floss, Sexi-Floss, Floss-Flex, etc., topic was discussed on another post here: https://donbastianwetflies.com/2012/04/30/march-brown-spinners/ I’ll be posting these flies separately – soon – with recipes. 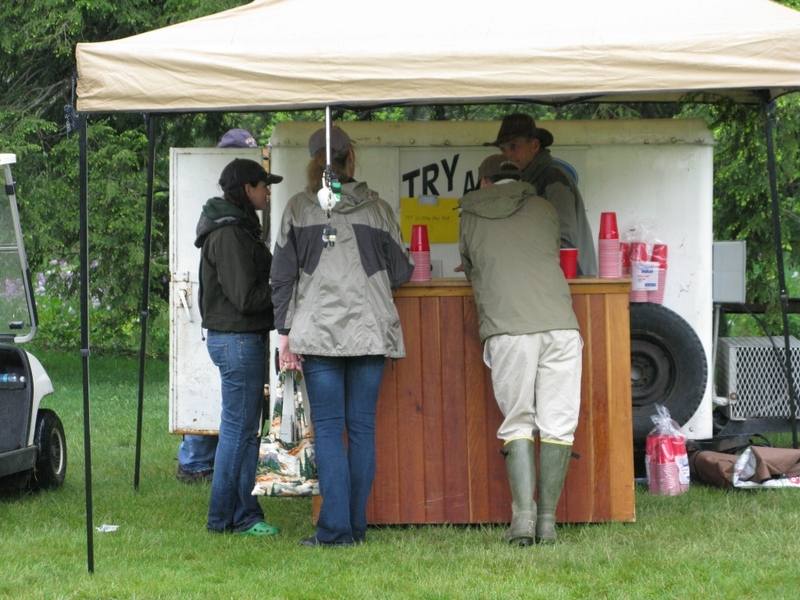 The beer trailer – still drawing a crowd. …and stuffed mushrooms. 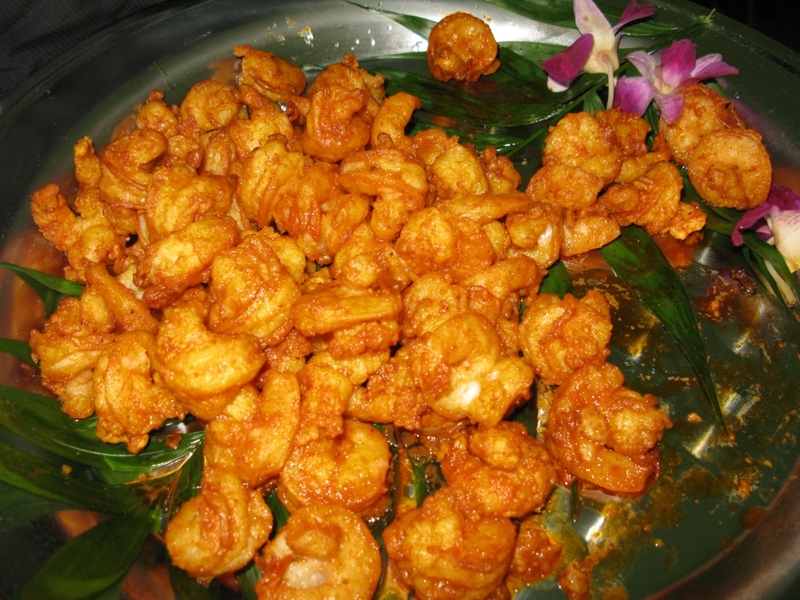 There were other appetizers I did not get photos of. Served by friendly, roaming wait-staff. 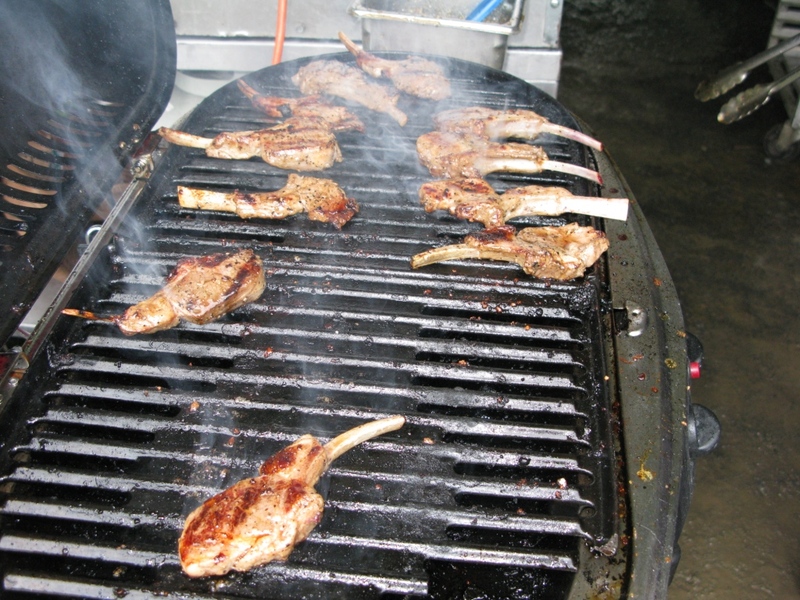 Lamb chops sizzle on the grill. Am I making you hungry? 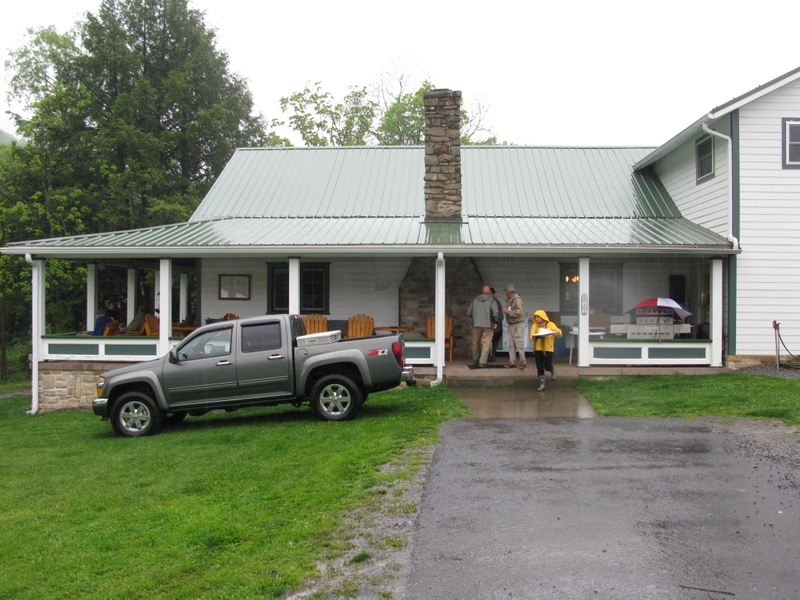 View of the Harpster cabin. 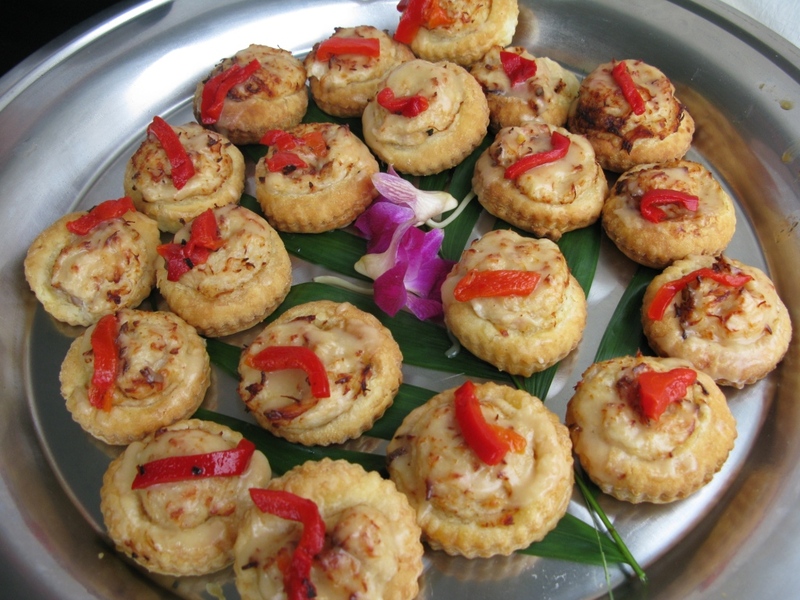 A waitress carries a plate of appetizers. 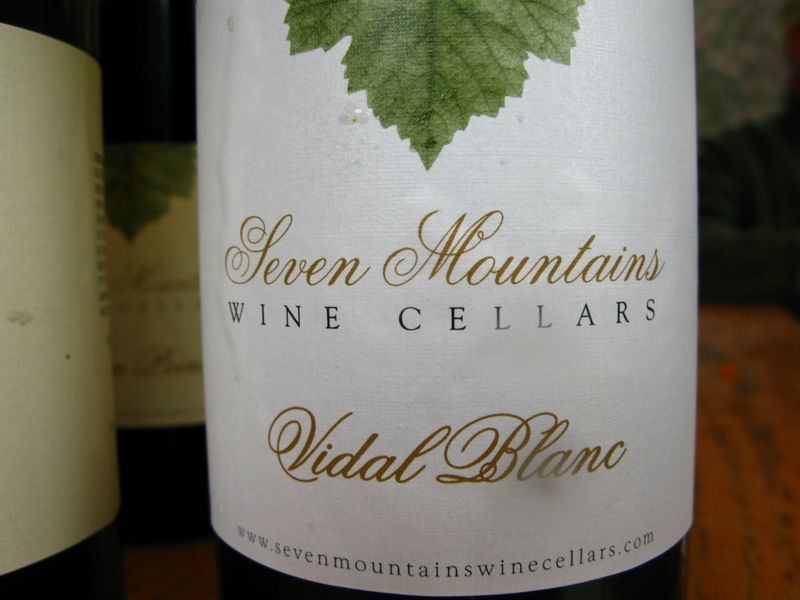 …and a Vidal Blanc, among their wines at the event. 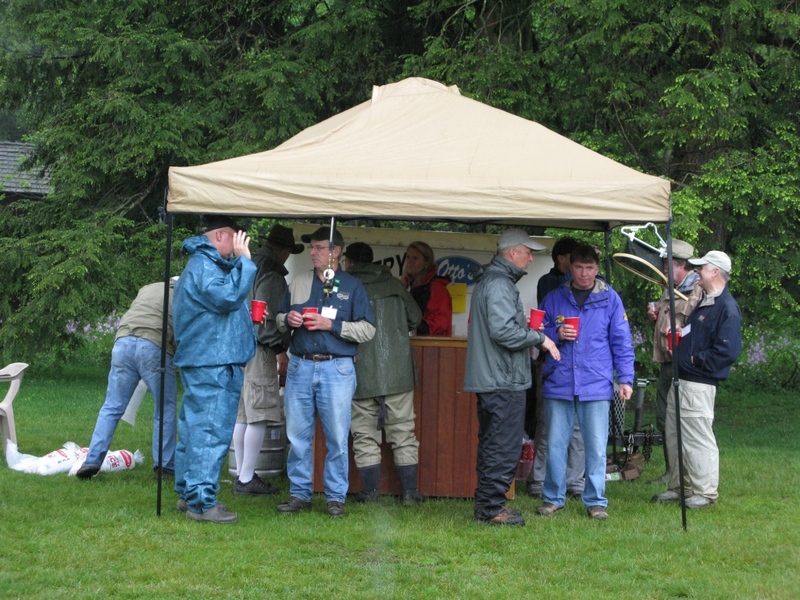 Meanwhile, the Otto’s Brew Pub beer trailer still draws significant attention from the contestants and guests. Last year the weather was unseasonably warm, early. Hatches and blooms were all well ahead of schedule. 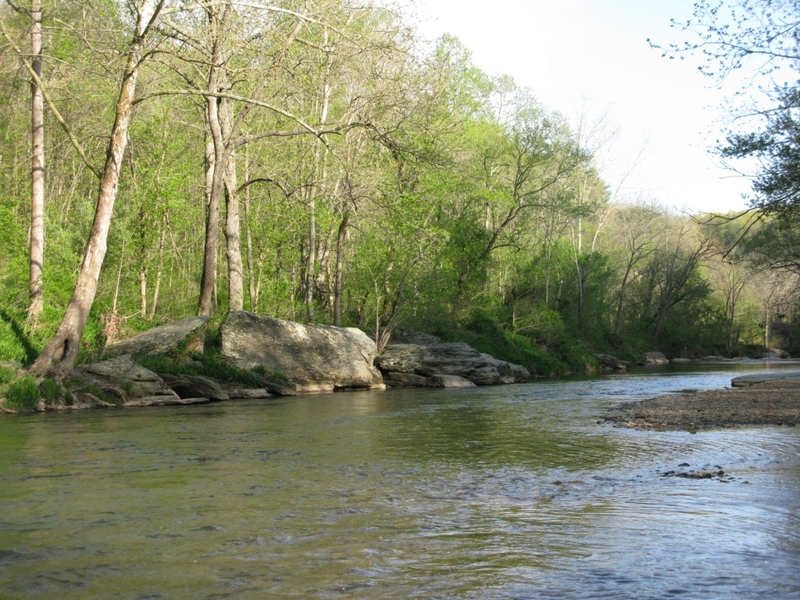 In early May, the day after Mother’s Day last year, the Green Drakes were hatching on Spruce Creek. This was way early for them by almost two weeks. 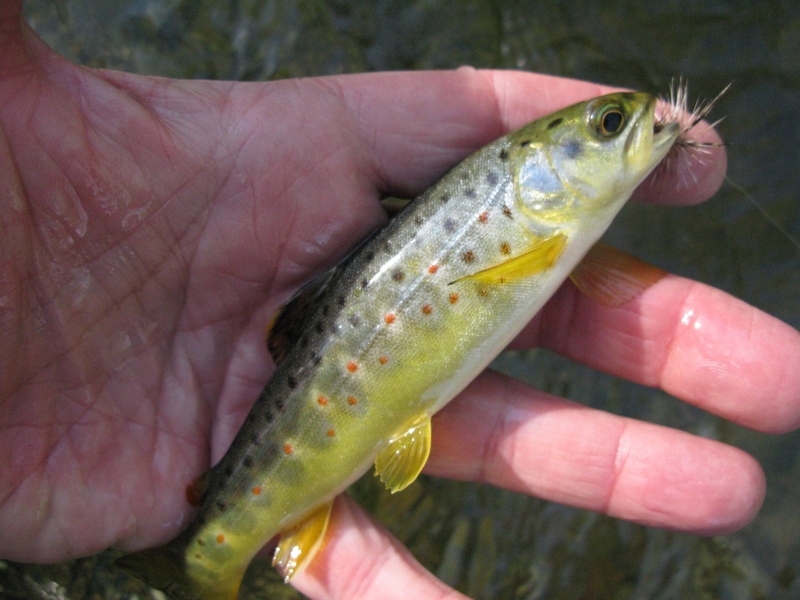 There were enough duns hatching that some trout fed on them. 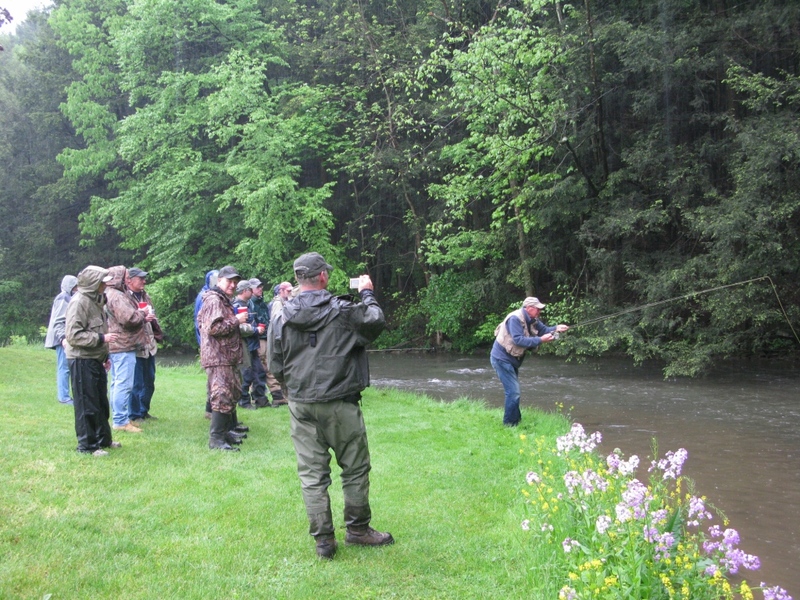 Joe Humphreys gives a nymph fishing demonstration. 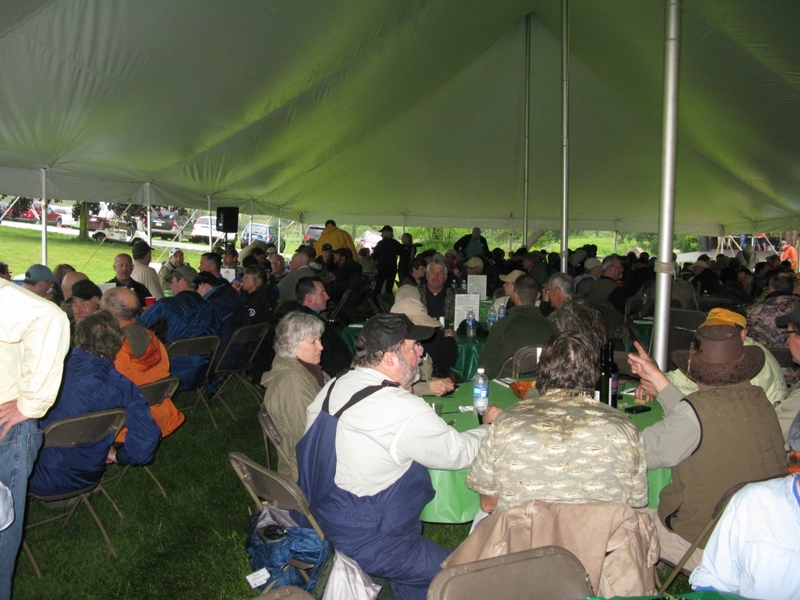 Attendees prepare to enjoy the evening dinner under the main tent. 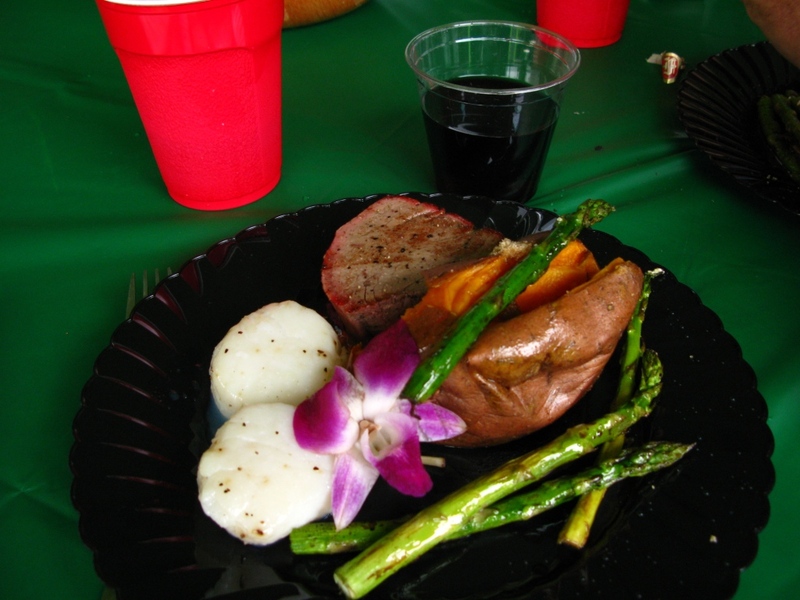 The entree – filet mignon, sea scallops, baked sweet potato, and asparagus. All the food was excellent! 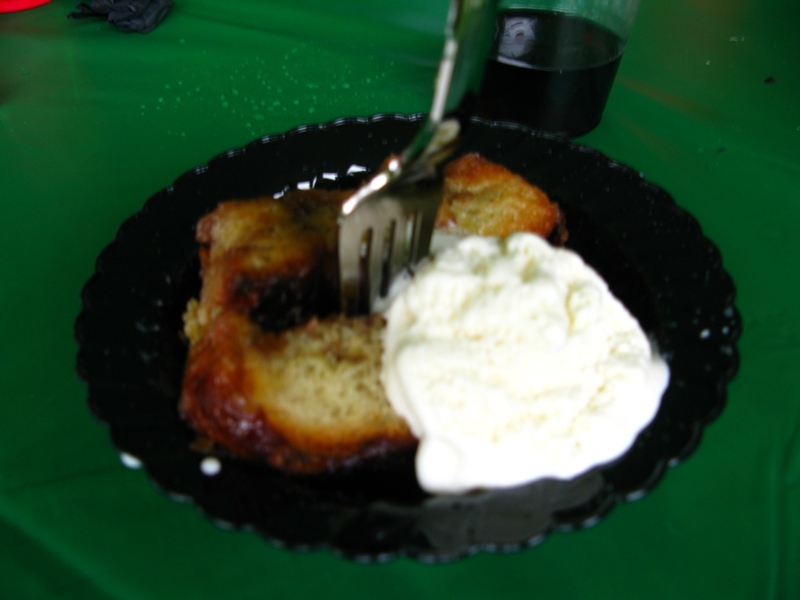 Apologies for the less-than-sharp image – dessert was the legendary sticky buns from the State College Diner, and vanilla ice cream. A bonus for my participation – I get to fish after dinner. 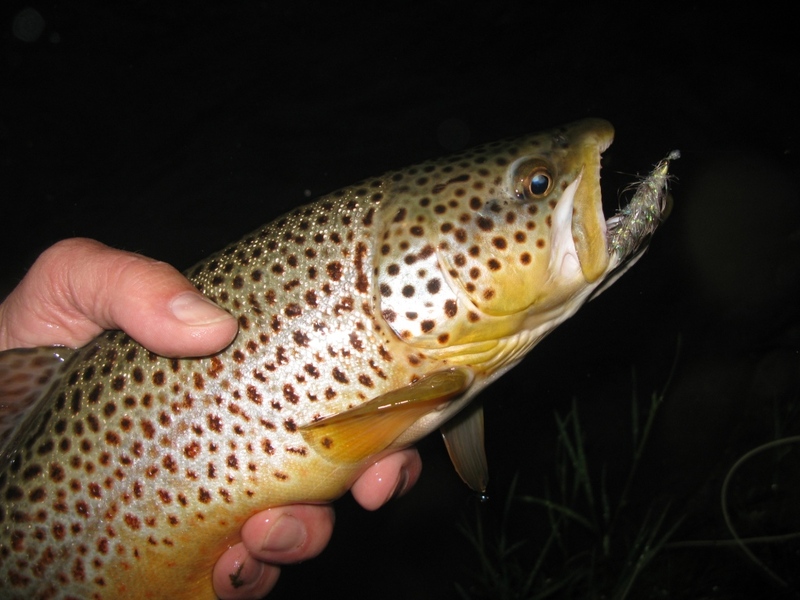 Here’s a brown about 19″ – taken on a white Krystal Bugger. Another very nice brown on the white Krystal Bugger. Of course, this report of this day can not end without the big-one-that-got-away story. After landing these two nice browns, I went downstream and hooked another nice trout, but lost that one when the hook pulled free. 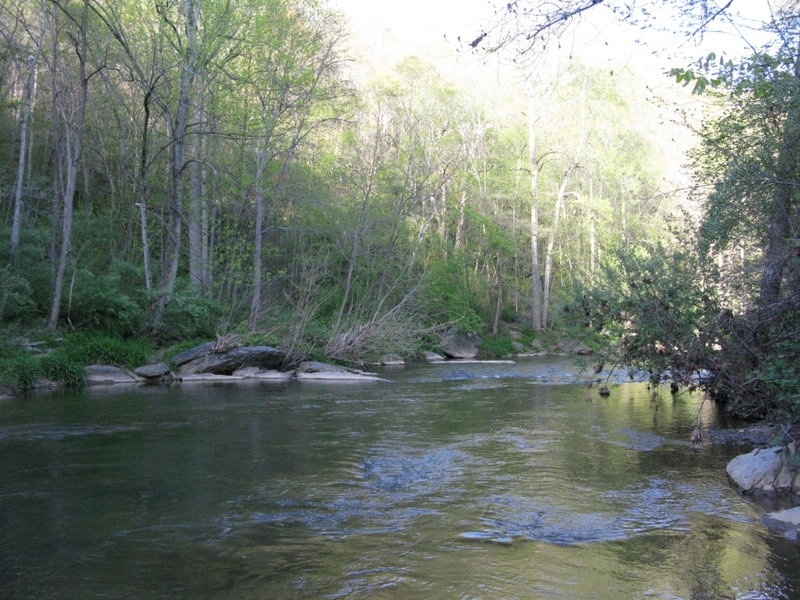 The next pool below that, I hooked a real hawg. I mean, this fish didn’t even move off the bottom. He just gave a heavy head-shaking and pull of serious weight, then after about ten seconds, my 3x tippet broke. I believe that trout was over two feet long. I went to the beer trailer for one nightcap beverage and then headed back to my friend Paul’s for the night. His hospitality saves me from a drive of an hour-and-a-half. 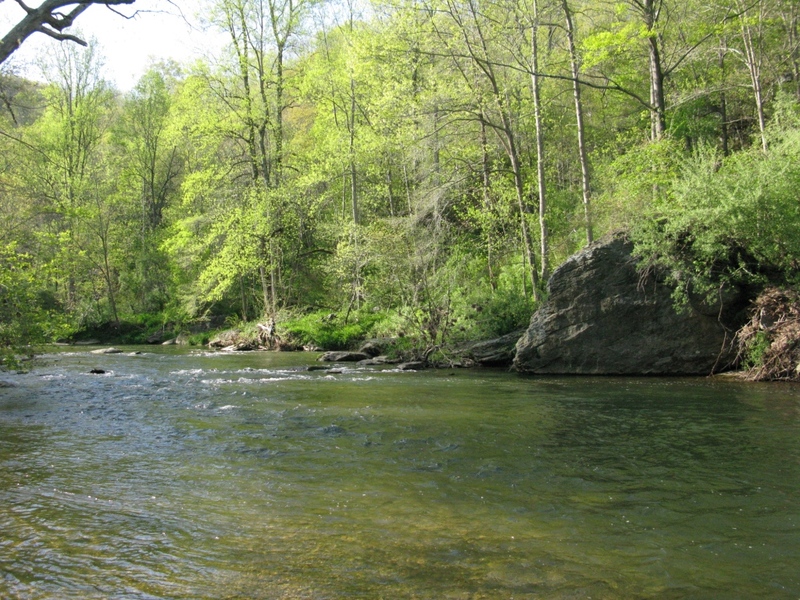 I’m leaving shortly to fish on Spring Creek above Bellefonte this afternoon and evening. 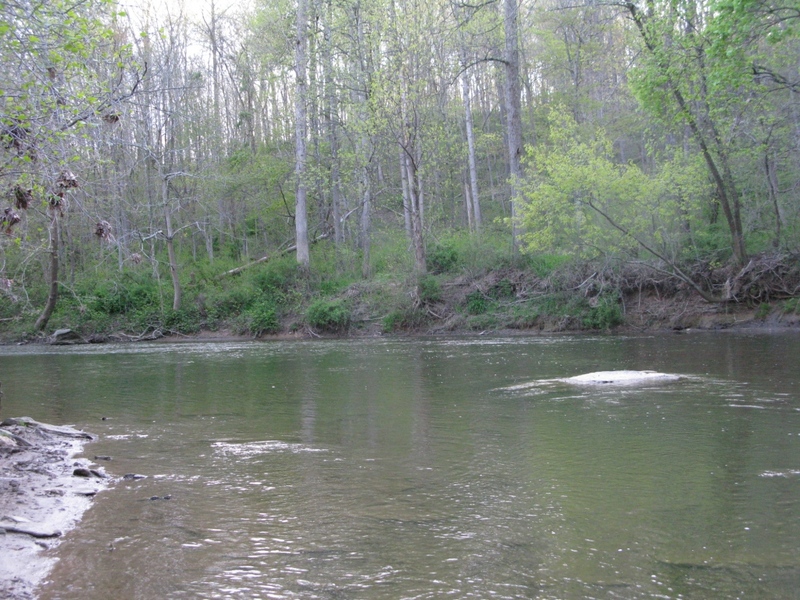 Monday May 13th, I’ll be on Spruce Creek at the On The Fly Event. Hope you enjoyed this post! Thanks to all site visitors for your support of my blog!